Just World Educational President Helena Cobban and guest Nora Lester Murad discuss Israel's continuing waves of attack against Palestinian life in Jerusalem, which Ms. Murad describes here as "The front-line of the Palestinians' ongoing Nakba." Ms. Murad is the co-author of the recently published book Rest In My Shade. This episode is a complement to the column Ms. Cobban published on this topic in Mondoweiss on April 3, 2019. 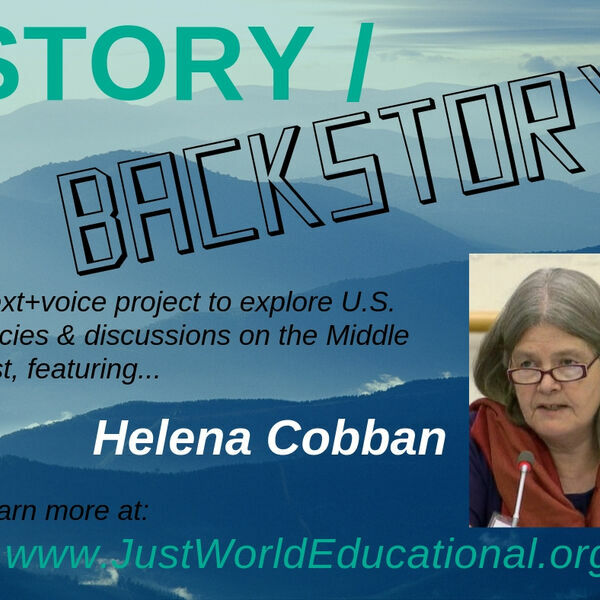 Helena Cobban:1:27Hi, I’m Helena Cobban, the president of Just World Educational. This week’s podcast is the seventh in our series “Story/Backstory”, which explores Washington’s current policies in the Middle East, and the Middle East itself, in a broader historical perspective. Each of the weekly podcasts in this series is linked to an opinion column that gets published a couple of days earlier, usually on the great Mondoweiss website… The current podcast is no exception. My written column on this topic was published on Mondoweiss.net on Wednesday, April the 3rd. This week, I’m delighted to have as my guest on the podcast Nora Lester Murad, a writer and activist who spent 13 years in Palestine before she relocated to New York City in 2017. Eight of those years, she spent living in Jerusalem, and after she moved from there to nearby Ramallah she continued to commute back and forth to Jerusalem. Ms. Murad was a co-founder of Palestine's community foundation, the Dalia Association, and the founder of a community-driven aid accountability initiative called Aid Watch Palestine. Helena Cobban:1:46Her first book, “Rest in My Shade”, was published just recently by Interlink Books, and is now available wherever books are sold. It’s a poetry and art book about roots. I can’t wait to read it! Currently, Ms. Murad is teaching critical humanitarian studies at New York’s Fordham University. Today, to make more time for you to listen to the great conversation I had with Nora Lester Murad, I’m not going to read the whole text of my column. I’ll just give you a brief digest of it—though of course I hope you go to Mondoweiss and read the whole thing! Basically, the column tracks what I identified as the four successive waves of the Zionist-slash-Israeli attack on Palestinian Jerusalem. The first was in 1948, when the Jewish, later Israeli, fighting forces ethnically cleansed the whole of West Jerusalem of its Palestinian inhabitants. Incidentally, West Jerusalem was the most thoroughly ethnically cleansed of all the urban areas that the Jewish/Israeli forces took hold of that year. Helena Cobban:3:26The second wave came in 1967, after the Israeli military swept into East Jerusalem and the whole of the rest of the West Bank and started taking some extremely damaging moves against those newly occupied parts of the city. That year, the Israeli Knesset also annexed East Jerusalem to the State of Israel, though it’s worth noting that that annexation has never been formally recognized by any significant external power—including the United States. I identified a third wave of the assault as coming in 1993, with the signing of the Oslo Accords between Israel and the Palestinian Liberation Organization, the PLO. Prior to that year, East Jerusalem had still retained its role as a regional capital for the inhabitants of the rest of the West Bank. They would come to the city for its fine hospitals, schools, shops, and other institutions, as well as for its Muslim and Christian holy places. But immediately after the signing of the Oslo Accords, the Israeli authorities worked systematically to cut East Jerusalem off from its West Bank hinterland, most blatantly by erecting a ring of checkpoints on all the roads leading between the West Bank and Jerusalem. These checkpoints have since been hardened and connected by Israel’s infamous, 30-foot-high Wall. .
Helena Cobban:4:16The checkpoints have always been extremely discriminatory, since cars with yellow Israeli plates fly right through them, while no cars with West Bank plates are allowed through at all. In my article I identified the Fourth Wave of Israel’s attacks on Palestinian Jerusalem as having been launched when President Trump moved the US Embassy to Jerusalem last year, sending a strong signal that anything the Israeli government might choose to do in the city is quite okay by Washington. In each of these waves, I noted how they were accompanied by a new phase of the Zionist project of implanting Jewish settlers into and around the city, in a determined effort to replace its indigenous Palestinian population as the latter were being systematically squeezed out. In the conversation with Nora Lester Murad that follows, she evocatively describes Jerusalem as “the front-line of the Palestinians’ ongoing Nakba”, that is “catastrophe”. Helena Cobban:7:09I'm here on the phone with Nora Lester Murad and Nora, I'm delighted to have you on the podcast. Helena Cobban:7:17So, Nora has lived in Jerusalem and then in nearby Ramallah for several years, many years, from 2004 through 2017. So I'm really excited, Nora to have you here to give some feedback on the article that I published earlier this week on Mondoweiss and also to talk about some of the many things that you observed and participated in when you were there, setting up and running what sounds like a really interesting community foundation called Dalia Community Foundation. So, let's start off Nora with any kind of observations you have about my article on Mondowise. Nora:8:05Oh, sure. your, your article "Palestinian Jerusalem faces a ‘Fourth Wave’ of Israeli assaults," was really such an impressive overview and comprehensive overview of the very, very long history of systematic assault by Israel on Palestinians in Jerusalem in particular. And it's extremely valuable. The main comment that I had was your use of the word wave in the title because waves add flow and I don't think there's very much adding in the the assault on Jerusalem that is just pretty much flows. One thing you did comment on is by breaking down into different pieces of chunks of time, how changes in the macro-level can provide opportunities for the Israelis to go in and create a new wedge or a new strategy or to implement a strategy that they've had in their back pocket. And it reminded me a little bit of Naomi Klein's Shock Doctrine or Antony Loewenstein, Disaster Capitalism, where they talk about how certain kinds of macro-political or economic or even environmental developments can create a new situation that allow a lot of people to exploit and then profit ultimately profit from a disaster. And I think that's also very implicit in your article. Helena Cobban:9:41Oh, that's a great observation. Thank you so much. I think, you know, when I was talking about waves, I wasn't really thinking of them as flow, and I was thinking of them coming in on top of each other. So yeah, that's good to have that clarified. And I guess, you know, in terms of the macro coming down to affecting what happens in people's daily lives and Trump sort of, you know, opening the floodgates to people thinking of Jerusalem as Israel's capital was such a macro event. Helena Cobban:10:15I'm particularly interested in the fact that you had that very granular experience in Jerusalem and also in Ramallah, and I'd love you to, if you could share with the listeners, many of whom may not have ever been to Jerusalem, or certainly didn't have the kind of close relationship with daily life there that the Palestinians live. What are some of the main daily obstacles that they, I know that's a very broad question, but just tell me a few stories about, you know, people's daily lives and what happens to them under this very bizarre, and oppressive regime. Nora:10:56Sure, I'll try to. Well, as, I think it's implied in your article, there are Palestinians, different groups of Palestinians with different statuses. The Palestinians in the West Bank, the West Bankers have a certain kind of ID card. The ones in Gaza have a certain type of ID cards. The Palestinians, who are citizens of Israel, have a certain type of ID card. And then of course, refugees, the registered ones by UNRWA, and then unregistered refugees who tend to have the worst situation when they are in refugee camps. And Jerusalem is different than all of those. Jerusalem is unique. Of course, all of those identity cards. Identity card doesn't sound very important to someone like me sitting in New York City right now. But, the identity card is first of all issued by Israel and second of all determines where you can go. So, people with orange identity cards can't travel certain places, people with blue identity cards have the most mobility. People with green identity cards are very restricted. So, just on a kind of daily level, your identity card determines where you can go and where you can go determines where you can work, where you can go to school or can't go to school, and sometimes even determines who you can marry and cannot marry. Nora:12:29Because when a Palestinian, let's say from Jerusalem, marries a Palestinian from Nablus and this is a real situation. I'm talking about a girlfriend of mine who fell in love as people do and married a man from Nablus. She could not live in Nablus with her husband, because she would lose her blue identity card, which would mean losing the privilege of seeing her father ever again. Helena Cobban:12:56Sorry, could could her husband come and live with her in Jerusalem? Nora:13:00And her husband could not come and live with her in Jerusalem. West Bankers are not allowed into Jerusalem without a military permission, which is extremely difficult to get. The only ones that get it really are workers that Israel has chosen, that it needs to come and work in certain jobs inside Israel. Otherwise, West Bankers can't get into Jerusalem. People from Gaza can't get into Jerusalem and people from Jerusalem are not supposed to go to the West Bank, but they do all the time. Nora:13:33They can also travel inside Israel into the areas that Palestinians call 1948 or inside the Green Line. But my friend who had a blue identity card, an Israeli identity card, she could travel to visit her husband in Nablus. But if she stayed there and established a residence, she would lose her blue identity card, because Israel has a policy called the center of life policy that if a Jerusalemite ceases to have their center of life in Jerusalem, they lose their residency privileges and become therefore susceptible to Israel's denial of entry at any time. They have to request military permission in order to get back into the place where they were born, to the place where their parents lived, to the place where they're, you know, their cousin is getting married or their grandmother is dying or whatever, based on that center of life. Helena Cobban:14:31It sounds just like the South African passbook system, where the central government issues pass books that determines where you can live, where you can work, where you can marry. In this case, as in the South African case, no justification under kind of the natural order of things. You know, one Palestinian living in one city wants to get married to another Palestinian living in another city and can't. I mean, that's bizarre. That's outrageous. And then those lines between, so called Jerusalem and so called the West Bank. First of all, I mean, as I think I said in my article, you know, before Oslo, that was a very extremely porous thing. The municipal boundary, you know, people would come and go and Jerusalem continued to act as the sort of the regional capital for all the Palestinians in the West Bank. But then after Oslo, the Israelis clamped this ring of steel around East Jerusalem and cut off those people. So it does, I mean it just sounds at a human level unsupportable. Nora:15:56Unsupportable and yet somehow they continue to impose these kinds of, you said, used the word bizarre. I would agree. Bizarre and almost surrealistic kinds of policies. And what's even worse is that the policies are not really policies. They can have a new policy every day if they want to. And they're not published anywhere. They're not discussed anywhere. Anything that happens under the umbrella of security, I put that in quotes, is kind of approved without very much, if any, civil society supervision or oversight. So, just to give you an example of one of my, the most bizarre cases, was a friend of mine who was a young and involved in different kinds of resistance activities in Qalandiya refugee camp. Nora:16:54Qalandiya Refugee camp is right between Jerusalem and Ramallah and it's administered by the United Nations. So, Israeli soldiers should not be going in there on a daily basis, but they do. And when they do, there's some kind of a mechanism by which the young men, generally men, notify one another that there are soldiers in the camp and they go up onto the roofs and they throw rocks onto the jeeps, the tanks and the jeeps that are coming into Qalandiya camp. I'm not a proponent or a supporter of any kind of violence really, except to say that a rock is not going to do much when thrown at a four to five jeep or a tank. And yet those jeeps and tanks will turn around and fire live ammunition and kill those young men who were trying to defend their own refugee camp. Nora:17:57Remember this is not Palestinians going into Israel to do some kind of troublemaking. These are Israelis that are going into Palestinian areas to do troublemaking. So, one of my friends was arrested. He was arrested after he was shot. They came looking for him. He was shot in the leg. He was able to escape. He spent almost a year in Ramallah Hospital. On the day that he was being released, it snowed. So he had this idea that because it's snowing, the soldiers weren't going to come get him. So he would go home and see his family and the next day he would go into hiding because he was wanted, but the soldiers did come despite the snow and they arrested him. So he went almost directly from the hospital into jail and in jail, he was brought before a military judge, because these are not civil courts, these are military courts. Nora:18:57And the judge told him, I will keep you in jail for five years unless you get married. I'm going to let you go. And if you get married, I won't pick you up again and put you back in jail. Now that sounds so surrealistic, so almost comical, but the judge had this idea that if this young man gets married, then he would have responsibilities and he would cease to be involved with this resistance activities, which, I think is true. I think that there is a strong sense of being responsible for your family. And the married young men are much more likely to stay out of resistance activities. So, he went out of jail and spent three or four months looking and he found a young woman. She was I think 15 at the time, he was 17. They got married and immediately had three children and it's been, a very, let's say, tumultuous and unnatural kind of a development of a family. But the fact that a military judge would tell someone, I'm going to put you in jail unless you get married. Where does that happen? Helena Cobban:20:19That is bizarre. Really, boggles the mind. Actually, It, that's interesting, the points you made are so interesting there. One is that the military court is acting inside the municipal boundaries of Jerusalem, right? Because Qalandiya refugee camp, like Shufaat refugee camp, are inside the municipal boundaries of Jerusalem. But when they built the wall, the Israelis carefully excluded those two areas from the area inside the wall. So, they are kind of, they're all in a sort of legal limbo. I guess you could say that the whole of the military occupation of Jerusalem and the West Bank is a military limbo. But these people's situations seems particularly vulnerable. Nora:21:12Yeah. Well, your use of the word legal is interesting because, Israel does all kinds of things that are illegal by international law and absolutely immoral by anybody's morality, but they create laws or rules or municipal ordinances that allow them, and therefore they make quote "legal something" that is really quote "illegal". So it's, it's really a funny thing. Israel is often saying that they're abiding by the law, but it's a law that they have created, and distorted and which continues to develop. I can give you an example about that if that's of interest to you. Helena Cobban:21:58Oh, sure. And then I also, before we finish, I want to ask you about home demolitions. Nora:22:04Yes. Well, this is actually a home demolition example. I'm glad you asked a question. So, I have a dear friend, his name is Nuredin Amro and anyone who's interested in his story can read it in the Washington Post. In 2015, his home was partially demolished. And what's interesting is the Israelis have created law that enable them to demolish homes for various reasons. One is for security reasons. So, if someone in the home is deemed, I'm going to say the word deemed not convicted, because these are not legitimate courts, but if they've been deemed to be guilty with a security crime, maybe attacking somebody or attempting to bomb something or threatening someone with a knife, then the whole house of the family will be demolished. Even if no one in the family knew that this person was going to do this. Nora:23:04And even if that person wasn't living at home at the time. So it's a punitive measure that's under the security demolitions category. But then there are administrative demolitions, which is when a home, or a part of the home, was built without a building permit. And those homes or parts of homes are liable for demolition. it sounds very logical and civil and civilized on the surface until you find out that they do not grant building permits for Palestinians, not only in East Jerusalem, but anywhere in Area C, as you talked about in your article. So that means that if your family is growing, it's quite natural that you might add a room onto your home because you no longer can survive in a bedroom an a living room and a bathroom. You now need a family room or a second bedroom or any other room to natural family growth. Nora:24:08But they will apply for a permit and which costs money and there'll be extended so they have to pay more money. It'll be extended to pay more money. And this can go on for years and years without ever getting a building permit. So many families will just build and hope that it's not discovered and that the Israelis will not demolish. That would be considered a quote "legal demolition." If somebody built an an an additional room to their home, it would be considered an illegal, and therefore the demolition would be considered legal. But Nourdin Amro was not demolished under either of those two situations, neither security nor an administrative situation. His was a municipal ordinance where the municipality came by and told him that he had to clean up the public way in front of his house. His house is on the way between two parts of the city where people have to pass through to get to pray at Alaqsa on Fridays. Nora:25:20And they said that the, the, the fence and the plants that were along the fence, which he had planted to give themselves a bit of privacy as the hordes of people trump through on Fridays, that they were in the roadway in the public way and that they needed to be removed. So, he removed and complied with this municipal order, but was demolished anyway. The fence was demolished, the whole garden was demolished and one of the rooms was demolished anyway. Nourdin's house was not demolished under a security rule or a breach of an administrative rule. It was demolished under a municipal ordinance, a cleanliness ordinance. And if you read that ordinance, according to the lawyers, there's no, how do I say? Demolition is not a legal consequence for the violation of that ordinance. You can be fined for violating the municipal ordinance, but demolition is not a consequence that is provided for in the ordinance itself. Nora:26:41So even Israel's own quote "legal demolitions" are an evolving policy-area. They will demolish under a new ordinance. In fact, they demolished five or six homes under that municipal cleanliness ordinance at the same time. And then they wait to see if the courts are going to uphold it or not. And this is a way that they can develop new policy at the expense of Palestinians without having to, let's say, write down a policy saying we want to demolish more homes. They just do it. And if it doesn't get caught in court, they just continued to do it. Helena Cobban:27:25So it's kind of don't ask for permission, but go ahead and then see if you can get away with it. Wow. Nora:27:33And go ahead and see if you can get away with it. Helena Cobban:27:38That does raise a sort of a related issue for me, which is that of Palestinians not participating in the municipal elections because, you know, you would assume that in a well-run city, the residents of the city would have democratic oversight of all such sort of planning and zoning-regulations and implementation of those regulations. Now, Palestinians, as far as I understand it, overwhelmingly have said they will not participate in municipal elections in Jerusalem. But there was one person Aziz Abu Sara, who lives here in the Greater DC Area, who's a Jerusalem Palestinian. He thought about running in the last municipal election. What, what do you understand about this whole issue of taking part in the elections or not? Nora:28:41Well, I certainly wouldn't want to speak for Palestinians and it's a very difficult situation to be in. If they do not vote, then they will not, then they definitely won't have anybody representing their interests. And the system will go on, there will be elections, people will be elected and the government will run. On the other hand, if they do vote, they're granting legitimacy to a system of quote representation on quote that is not legitimate and it's also not representative, because even if someone that Palestinians elect is elected, they will not be allowed to to change many of the really horrific and harmful rules that are imposed upon Palestinians in Jerusalem every day. Things that range from tax rules that are unfair to security surveillance. That's unfair to even the way, I don't know if you've heard of these, there's a word for them, but they're like big trucks that are tankers, that are filled with stinky water, sewer-water. Nora:29:56They drive up and down the streets and they spray them into homes and establishment. Do you remember the name for those? Nora:30:07Right, right. You're right. So these are the types of things that Jerusalemites are vulnerable to all the time. And if you do elect to Jerusalemite in the municipal elections, a Palestinian, they will not be able to change any of those practices. So that person is put in an untenable situation. I have a lot of sympathy for the difficulty of that, of that decision, and I felt that myself here in the United States when I've been offered choices that I didn't think were the either choice was a good choice. And it's hard to know what's the best way to use your voice when you are in that situation. Helena Cobban:30:52Right. And I mean just as a sort of underlying thing regarding municipal governance in Jerusalem, ever since 1967, they have made sure that is the Israeli authorities in the city and nationally, that the proportion of Palestinians in the city remain beneath. I think they wanted to be beneath one third. So it's kind of, regardless of anything, the Palestinians can do, It seems that from Teddy Kollek onwards, Teddy Kollek, who was revered in much of the left in this country for being, you know, an enlightened municipal leader and all of that. And the people who were working for him published a book saying, no, you know, this is exactly what his goal was to keep the proportion of Palestinians in the city beneath a certain percentage. So it's kind of Catch-22 for them. Nora:31:54Yeah. I'm glad you mentioned that because a lot of people in the United States or in any civilized country are shocked that there was a government policy that says that the proportion of Palestinians cannot exceed a certain percentage. So there's a, demographically gerrymandered population control. I don't know how you would say that properly, but it sounds very racist and I think it is very racist. And the way to implement that, there's only one way to implement that by getting Palestinians out of Jerusalem and by bringing Jews into Jerusalem. And they get Palestinians out of Jerusalem by making the city unlivable, and through home demolitions, through the direct revocation of residency rights or of national insurance, which makes it impossible for people to stay in Jerusalem and they have to move to other parts of the West Bank. And so this whole series of practices that make Jerusalem so difficult for Palestinians is part of this policy to keep the Palestinian population low. Nora:33:03And, the other way to bring Jews into Jerusalem is by establishing settlements, which we didn't talk about. Establishing Jewish settlements and then incorporating them into the municipal boundaries of Jerusalem, which then increases the Jewish population. It's all very systematic and organized. There's nothing natural or organic about it at all. it's really sad and it's quite angering to think that this has gone on for so long and continues to go on. I call it in fact the front line of the Nakba, because a lot of people think about the Nakba by 1948 as having been an event where there was a large expulsion, but then Nakba is ongoing. And I think Jerusalem is the front line of the ongoing expulsion, colonization and dispossession of Palestinians. Helena Cobban:33:56Wow, that's a powerful image. Thank you so much Nora, for coming onto the podcast and sharing all these experiences. I mean, as you say, it's very angering and I'm sure that you're doing a lot. By the way, I will mention your book, which has just come out, Rest in my Shade. And maybe another time on the podcast, we should talk about the book, which hopefully is a little bit more hopeful than talking about Jerusalem. But anyway, thank you so much for being with us. Nora:34:25Thank you for having me.